Polarized sunglasses have a filter that reduces glare from reflecting surfaces (water, snow, road pavement) which interfere with vision. 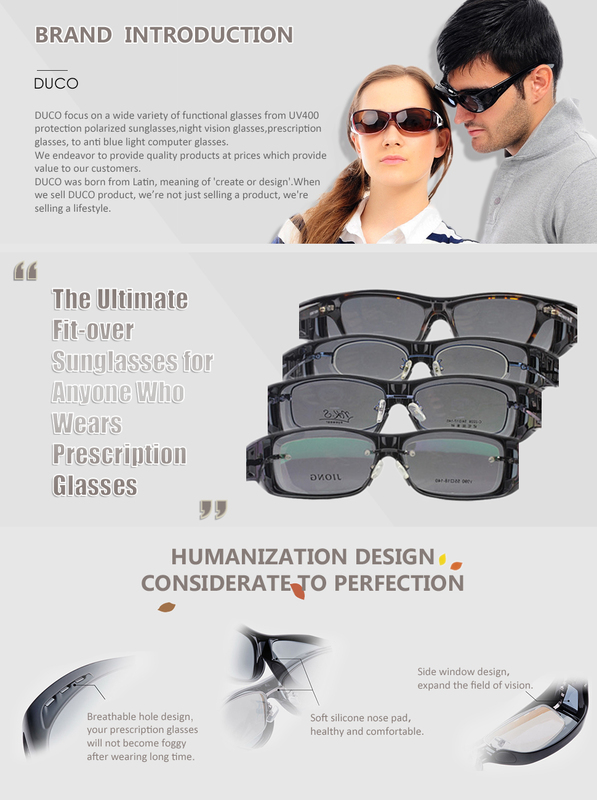 They can be highly useful for sports, driving, and fishing by helping you to see more clearly. They provide premium protection against the sun's harmful rays. 2- Choose the DUCO frame that is slightly larger in width and height than your frame measurements. If your frame width is less than 138MM,height is less than 39MM, please buy common size. If your frame width is longer than 138MM, shorter than 145MM;height is less than 39MM please buy plus size. If your frame width is longer than 145MM,OR height is larger than 39MM,please DON'T buy it. 1-Never clean your sunglasses with paper towels or clothing, which can leave scratches. Just use clean water and DUCO's included cloth to clean it. 2-Never leave your sunglasses under car's front window, especially in summer. Prolonged exposure to the oven-like temperatures inside a car can degrade the lens.